The 79-year-old is no stranger to scandal but he appears to be fighting a losing battle. 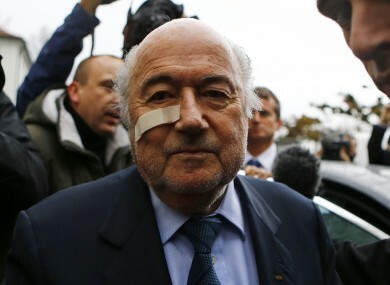 Sepp Blatter arrives for a news conference in Zurich. FACING CRIMINAL INVESTIGATION, Sepp Blatter cuts an increasingly lonely figure far from the football president who mixed with political heavyweights and tycoons. When the 79-year-old Swiss powerbroker told a stunned FIFA congress this year that officials found guilty of misconduct would be booted out of world football, he would not have been thinking of himself. But an eight-year ban from all football activity over a suspect two million Swiss francs (€1.8 million) payment to his former ally Michel Platini has left Blatter desperately battling to preserve his remaining claim to legitimacy as the man who brought untold riches to football. Unashamedly divisive — some called him a “Jesus” and others a rogue — and supremely confident of his own ability, Blatter was for nearly two decades a global force as controller of the world’s most watched sporting event, the World Cup. He repeatedly saw off all-comers after taking over as FIFA president from the scandal-tainted Joao Havelange in 1998. A useful amateur footballer who turned his hand to marketing, Blatter wheeled, dealed and shrugged off allegations of chicanery until Swiss police marched into a Zurich hotel in May and arrested seven FIFA officials. It was two days before a congress at which he was aiming to secure a triumphant fifth term. “Let me be clear: such misconduct has no place in football and we will ensure that those who engage in it are put out of the game,” Blatter said the day after the stunning arrests carried out under US arrest warrants. Blatter got his fifth term but with pressure mounting, announced four days later that he would stand down, with a new election later set for February 26. Some still did not believe that he would give up. But a Swiss investigation into FIFA accounts and the “disloyal payment” of two million Swiss francs to FIFA vice president Platini finally ended the Blatter reign. Both were temporarily suspended in October before they were finally banished today. Blatter has said many times he believes there is an international plot to oust him and that jealous rivals do not use the notion of fair play in their backroom battles with him. And rivals had a lot to be jealous of. Being head of FIFA for 17 years elevated Blatter to 70th place in the Forbes list of the world’s most powerful people. The former amateur footballer — an old fashioned striker — joined FIFA in 1975 from a post marketing Swiss watches. Blatter, who also worked as a public relations official for a Swiss tourism department and as general secretary of the Swiss ice hockey federation, claims credit for building up much of FIFA’s financial muscle. When he joined FIFA it was in a small Zurich building with about 10 staff. One story says that it was Blatter who went to the bank to get a loan when they could not be paid. But FIFA made about US$5.7 billion (€5.25 bn) in the four years between the 2010 and 2014 World Cups. Football’s world body now has 1,400 staff and is sitting on a cash mountain of about $1.5 billion. The workaholic Blatter says his main achievement has been to make football “universal” — the first World Cups in Asia (South Korea and Japan in 2002, although the decision was taken before he became president) and Africa (South Africa in 2010) came in his tenure. Hundreds of millions of dollars are given to national federations and in development grants. But since the day he became president in 1998, accusations of skulduggery have never been far from FIFA. The latest are over the awarding of the 2018 and 2022 World Cups to Russia and Qatar. In 2006 he tried to stop a book on FIFA’s scandals being published in Switzerland. And so the football world was divided until the Zurich arrests this year. Just before the FIFA election, Dominican Republic FA president Osiris Guzman compared Blatter to Jesus, Winston Churchill, Moses, Abraham Lincoln and Martin Luther King. The Asian, African and North-Central American confederations all backed him. But Europe turned against Blatter. UEFA leader Platini said Blatter lied when he said in 2011 that he would stand down when his fourth term ended in 2015. Platini, now an arch-rival, said Blatter could not bear a life of “emptiness” without FIFA’s power and money. Blatter, married three times, has relied a lot on his daughter Corinne in recent months. “He has a way of making people dependent or indebted to him, but not in a way that people regret it,” one Blatter confidant said. Email “Invincible no more - Blatter's fall from grace”. Feedback on “Invincible no more - Blatter's fall from grace”.